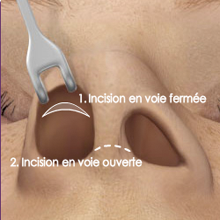 This procedure involves changing a particular aspect of the nose identified by the patient: it may involve altering the tip, changing the size or even straightening the nose. To understand nose reshaping surgery or Rhinoplasty it is important to have a basic knowledge of the anatomy of the nose. 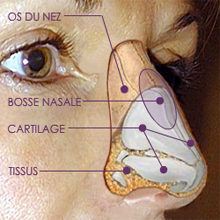 Schéma: (Bridge Nose hump Cartilage Soft tissue). 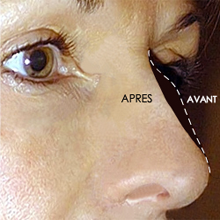 Nose reshaping surgery usually involves no visible scar (internal access through the nostril) but a complicated alteration of the tip of the nose may involve a small 3mm scar (external access). Scars are thus invisible or virtually invisible. New computer technology, particularly simulating “photo-morphing” mean that the patient is now able to preview aesthetic choices with the surgeon. The consultation starts with a photo session that helps to define a profiling plan. “Before” and “after” photos help to visualise and give an indication of the desired end result. The chosen profiling plan may not have contractual value as such but allows the surgeon to get a clearer idea of what the patient is hoping for. 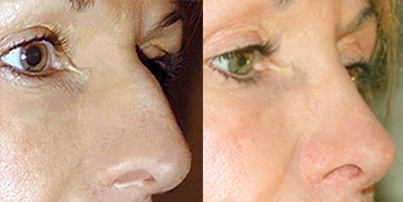 Men too are becoming more and more interested in nose reshaping surgery for facial harmony. This decision is often linked to unsightly physical changes following a previous injury. In certain cases where the need for reconstructive surgery is confirmed (scan results, obvious traces of accident), some the costs may be paid direct by Social Security. Some very slight imperfections may be treatable without the need for surgery. In these cases products (that eventually are reabsorbed) are injected into the nose and provide a trial indication over several months. These sorts of corrections are sometimes useful for retouching at the end of the first year following surgery – they can compensate for any eventual healing problems and help to obtain the desired result (5% of cases).